We found 14 matching items. 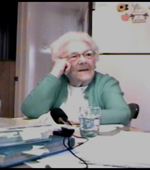 Interview of Bissett Creek resident, Elaine Ferrill. 2006 Interview with life long Mackey resident. Gloria Hope is a local sculptress who has worked in a variety of media. Now residing in Uxbridge, she often works in clay, merging elements of nature and the human form; she uses a variety of stains, oxides, acrylics, and smoke firings.